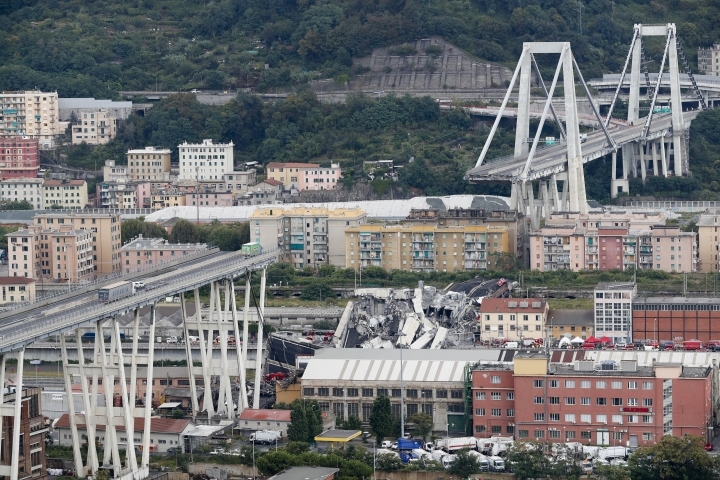 MILAN — Genoa's mayor on Tuesday announced that a 202-million-euro ($229 million) project by hometown architect Renzo Piano inspired by a naval ship has been chosen to replace the Morandi Bridge that collapsed last summer, killing 43 people. Mayor Marco Bucci said construction will take 12 months and the bridge should be completed, although not yet accessible, by the end of 2019. The bridge will no longer carry the name of Morandi, the architect who constructed the reinforced concrete structure that collapsed, but Bucci didn't indicate a new name. Piano's project incorporates weight-bearing columns that resemble the bow of a ship, and will be illuminated by 43 lamps casting a light shaped like ships' sails and representing each of the victims. Piano will also be the project's technical supervisor. The bridge crosses a densely populated area and is a key artery for much of northern Italy, including the port city of Genoa, the Ligurian coast and southern France. The decree awarding the three companies the project specified that necessity of having a project using weight-bearing columns and not stay cables "in respect for the psychological aversion that matured in the city after the collapse of the Morandi Bridge," which included metal support cables that snapped during the collapse. The cause of the Aug. 14 tragedy still hasn't been determined, but prosecutors are investigating poor maintenance or design flaws in the 51-year-old structure as possible hypotheses. Salini Impregilio has extensive experience constructing bridges, including a replacement of the Gerald Desmond Bridge in Long Beach, California, the Unionport Bridge being built in New York and the second bridge over the Bosphorus Strait. Salini Impregilo and Fincantieri have formed a new company called Peregnova to oversee the project, which they said would take 12 months to complete following demolition of the old structure, which hasn't yet started. Salini Impregilo said that the new Genoa bridge over the Polcevera River will have a 1.1-kilometer-long (1,200-yard) continuous steel deck with 20 spans and 19 elliptical piers. Fincantieri will build the steel structures at its Genoa-Sestieri shipyard and a facility near Verona, and transport elements to the worksite for assembly and welding, which the shipbuilder said would reduce operations to a minimum. Salini Impregilo CEO Pietro Salini said the company would work "to relaunch the city as quickly as possible and send a strong message to the entire country. Public works can kickstart the economy and start to create jobs again."